Mood board: Clean colour and marvelous architectural cutting gave Marni’s autumn collection a sophisticated, graphic quality that many designers fail to achieve. Cropped front capes with half moon shapes and trailing backs set the tone for the cool new mood. 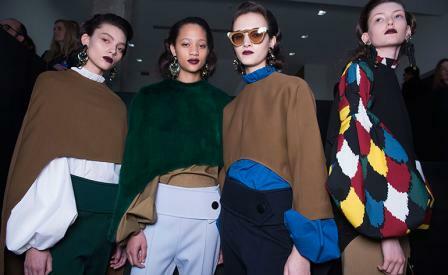 Best in show: Creative director Consuelo Castiglioni delivered on nearly every look on this well-judged show but our favourites were the exaggerated, puffed sleeves on printed dresses or shirts that billowed like cotton sails and were hoisted down with thick grosgrain ribbon. Finishing touches: A basic knee high boot was completely transformed by colour blocking elements on the vamp and knee rim that made it look deconstructed into its elements. Also intriguing were the new pointed toe pumps with either an arabesque brass and wood wedge heel or hexagon shaped colour block heel.